Explore the range of Luster teeth whitening products here at Mankind. Founded in 2007, Luster teeth whitening is a premium tooth whitening brand who use non-harmful technology to brighten teeth for a healthy smile. Constantly pioneering innovative, safe ways to whiten teeth without creating sensitivity, they’ve won multiple awards for their mouth rinses, toothpastes and other systems. 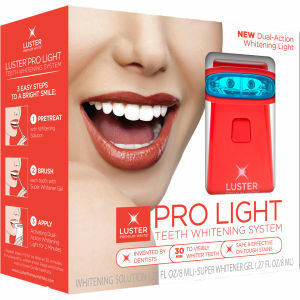 The Luster Teeth Whitening device is an innovative, dual-action light system which allows you to achieve a Hollywood smile in the comfort of your own home. Created by dentists, this unique technology works after just 30 minutes to whiten yellowing teeth. By reducing stains from coffee, natural discolouration and smoking, teeth will become whiter almost instantly. The Luster Now Instant Whitening Toothpaste is suitable for everyday use to reverse the yellowing of teeth and prevent cavities. Formulated with fluoride and Blueverite technology, this classic mint flavoured toothpaste works straight away to help you to achieve a white smile you can be proud of.